This is a guest article from Jeremy Antley who is currently pursuing his doctoral research on Russian Old Believers that immigrated to Oregon in the 1960’s. When not rummaging through the archives or taking care of his two dogs in Portland, Oregon, he also takes time to write about all things (digital) culture, (Russian) history and (board) games related on his blog Peasant Muse (peasantmuse.com). Over the past year, in moments of (supposedly) spare time, I helped play-test a new board game by Labyrinth designer Volko Ruhnke titled Andean Abyss (http://www.gmtgames.com/p-337-andean-abyss.aspx). I’ve been increasingly playing more and more board games, and when the opportunity came up to help with the development of a new title I jumped on board. You may remember that Matthew Kirschenbaum wrote on Labyrinth almost a year ago, in a post titled “Playing the Present: Gaming Egypt with GMTs Labyrinth.” (http://www.playthepast.org/?p=700) Perhaps inspired by the generally positive reception of Labyrinth, GMT Games announced in the opening months of 2011 that Andean Abyss would be the first title in the newly planned COIN (Counter-insurgency) Series focusing on historic internal war scenarios in which insurgency and the interaction of multiple sides played a major role. Andean Abyss seeks to model the Colombian experience with insurgent and counter-insurgent operations, focusing specifically on the period just after the demise of the Medellin Cartel in the mid-90’s and up to the middle of the past decade. Players can choose to be one of three available ‘factions’ (the long-standing and still active marxist guerrilla force known as the FARC, the right-wing paramilitary AUC and the drug producing Cartels) or the Colombian government itself. Each side has different victory conditions that they achieve using different methods, a design feature that acknowledges the fundamentally asymmetric nature of COIN. The Government must secure the cities and countryside, utilizing ‘sweeps’ and ‘assaults’ to find and then remove guerrilla presence while also training a balance of ‘police’ and ‘troop’ forces to secure, stabilize and improve (through ‘Civic Action’) the ‘support’ of a targeted region. FARC looks to erode support and produce opposition through use of terror and kidnap operations that discredit and sap resources from the Government on top of building a counter-state infrastructure, represented by the number of FARC bases on the map. AUC seeks to terminate the marxist forces through either ambush or assassination and wins only if they have more bases on the map than FARC. Finally, the build-up of both resources and bases is the goal of the Cartels, whose ability to bribe other factions and cultivate drug-processing facilities quickly makes them a potent force. Of course, it’s not enough to simply achieve victory- a faction must maintain their victory conditions until a ‘Propaganda’ event appears in the deck of cards that operates as both regulator of faction turn order and producer of game narrative events. Verbal negotiation and coordination between players is encouraged, as often factions can become temporary allies if a common goal is in all parties interest. What often emerges is a ‘castle in the sand’ situation, as players that take the lead must inevitably fend off attacks from all the others. What Train reveals in his comments is two-fold. Not only are irregular conflicts, a large field in which COIN is but one category, inherently difficult to model but the model’s validation largely relies upon how the designer frames the conflict and abstracts its range of effects. In the Consimworld Forum (http://talk.consimworld.com/WebX?14@755.n664cibN75U.4@.1dd517eb/0) for Andean Abyss, Ruhnke stated that the game will come with “extensive design notes explaining the rationale behind the game” in addition to a “sourced historical background on each of the 72 events” represented in the game deck. Validation, in part, for Andean Abyss will come from the expertise in sources Ruhnke used in creating his model. Later on in the same forum post Ruhnke states, “the historical notes in the Playbook are extensive…for anyone interested in how the game seeks to represent insurgency in general or the Colombian conflict in particular, there will be plenty to chew on.” This same statement could easily be applied to the Army Counterinsurgency Field Manual (http://www.fas.org/irp/doddir/army/fm3-24.pdf) (FM 3-24) released to the public in 2006. 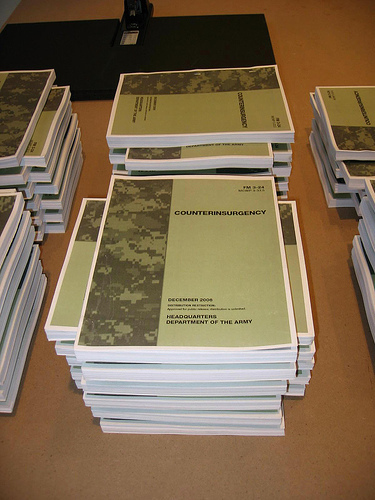 Something that I didn’t know, but Brian Train alerted me to in the ‘I’ve Been Diced’ podcast mentioned above, was that the 2006 Counterinsurgency manual was the first to contain an annotated bibliography and suggested reading list in the back for readers to consult. Once again, validation is sought from the expertise of the past. However, if we accept perspectives of the past viewed in the present as a partial source of validation, then we must also accept that our perspective of the past will eventually change and facilitate a new set of ‘expertise’ and ‘experiences’ from which to draw upon in creating updated sources of validation. Against this backdrop of constant re-evaluation and shifting perspective, board games become anchors in time regarding the analysis and understanding of the topics they explore. I mention this obvious point only because it has some very interesting implications for how we should understand, analyze and potentially use board games that model COIN specifically, and other conflicts generally. There is a flexibility in board games that digital games have yet, and may never, be able to equal. Anyone with the ability to read, write and make assumptions can alter the parameters and mechanisms of a game, or create a new one entirely, and play them through to see the results. A board game in its original design might act as an anchor in time, but its open nature and flexibility mean that all aspects of the anchor can be inspected for use in modification, or for creating new anchors all together. Take the case of King’s College student, Robert Hossal, who is documenting on his ‘Smart War Blog’ (http://www.smartwar.org/) about a project for his Conflict Simulation course taught by Philip Sabin. Choosing to model ‘Operation Fardh al-Qanoon‘ (http://en.wikipedia.org/wiki/Operation_Imposing_Law) (a.k.a. 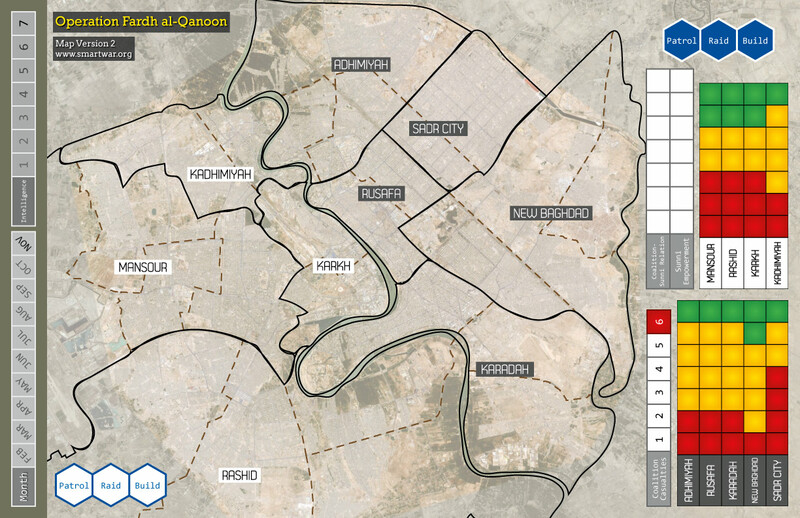 the Baghdad Security Plan), Hossal selected the first real test of General Petraeus’ re-visioning of how COIN operations should be carried out in a period that is widely known as the beginning of ‘The Surge’. Immediately questions of validation became apparent. “The problem with getting the simulation results to match up with reality is creating the baseline for results in the first place,” wrote Hossal (http://www.smartwar.org/2011/12/the-elements-of-an-operation-fardh-al-qanoon-simulation/), who later described how he intends to measure the impact of the two sides- Coalition and Anti-Coalition forces- in gameplay terms. Coalition forces will be tasked with promoting stability through reduction in violence, all the while trying to minimize both civilian and troop casualties when carrying out the delicate mix of offensive and security building operations. Anti-Coalition forces, which include Sunni/Shi’ite insurgents and al-Qaeda operators, can win through either ensuring that Baghdad remains in the throes of chaos when the game ends or inflicting enough casualties so as to greatly surpass the historic levels encountered, making the operation a ‘political failure’. Hossal is still in the planning/design phases, but hopes to release his draft rules and counters used in the game soon. All of this leads me back to my original question asked of Andean Abyss, a question that could equally be applied to Hossal’s ‘Operation Fardh al-Qanoon‘. Is the model presented a valid interpretation depicting the complex interplay of forces involved? While I mentioned earlier that validation can be partially achieved through source evaluation, Train’s comment on ‘discussion of the parameters and the mechanisms’ being the most valuable part of playing and designing irregular conflict games, I believe, forms the greater part of validating a potential COIN model. Because, really, board games through their abstraction cannot hope to ‘simulate’ a conflict, but they can spur debate and interpretation of how a conflict is modeled through the space afforded by their abstraction. Even better, these abstractions are not kept hidden from the player in ‘black boxes’ like those encountered in many digital games. This means that games like Andean Abyss and ‘Operation Fardh al-Qanoon‘ provide excellent pedagogical tools to be used when examining how insurgency is conceived and represented- the real benefit, the true source of validation, comes not from playing and winning the game but rather from playing and discussing what the game attempted to accomplish and whether or not it succeeded in doing so. Fabulous post, Jeremy. If I had had that “There is a flexibility in board games” paragraph a week ago it would have capped off my slides for the workshop I just ran at THATCamp Games (PtP retrospective post from the several of us who were there coming soon). One thing you eschew is the obvious political/emotional sensitivity of COINs topics, presumably a product of both their contemporaneity and their frequent gruesomeness, even by the standards of modern warfare. (Ben Madison’s Liberia game in particular seems to wallow in this: http://boardgamegeek.com/boardgame/31846/liberia-descent-into-hell-the-liberian-civil-war-1). Do you think board games are able to handle such topics in ways that a computer implementation would invariably trivialize or sugarcoat? Or is the medium not the message here? Thanks for the kind words, Matt. After following the twitter backchannel for THATCamp Games, I regretted not being able to attend. I look forward to your summary post! You are correct, I didn’t address the issue of political/emotional sensitivity in COIN topics directly. Certainly the conflict modeled in Andean Abyss qualifies as gruesome and contemporary, and the game surveys these topics abstractly and somewhat obliquely. For example, every faction except the Government may conduct ‘Terror’ operations that impact the level of support or opposition a particular region possesses. The specific nature of what the terror act was, or how it directly contributed to altering the political mood of the region, is left to the players imagination. 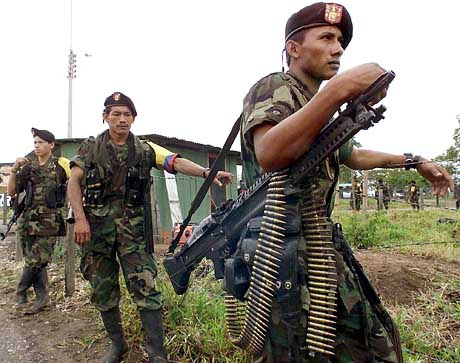 The right-wing paramilitary AUC, which were also known as ‘death squads’, have a special ability to ‘Assassinate’ and remove one enemy piece (including protected bases) from a region with underground AUC guerrillas, while the FARC conducts ‘Kidnap’ operations to raise resources for use in further operations. These are abstracted effects of real-life, often terrible, events that occurred in Colombian history and there is a valid concern in wondering if ‘gaming’ these elements mitigates their emotional impact or trivializes their use and operation. Tying this concern with your question presented above, I would look at Brenda Brathwaite’s Train (a ‘game’ about facilitating the transport of Jewish prisoners to Nazi concentration camps via trains) as an example of how board games hold the edge over computer games in modeling political/emotional topics. In her GDC talk on Train, titled “How I dumped electricity and learned to love design” (http://www.gdcvault.com/play/1012259/Train-(or-How-I-Dumped), Brathwaite discusses how one of the drawn card events, ‘Derail’ (in which half the people go back to start while the other half refuse to re-board), allows for multiplicity of interpretation that simply could not be coded in a computer game. Because the game does not explicitly state what to do with the half that refuse to re-board the train, the players begin to engage in what Brathwaite calls ‘Rules Lawyering’; arguing over the interpretation makes the players complicit in both the involvement and outcome of the game. This capacity to engage players in a ‘multiplicity of interpretation’ is something computer games can’t do very well due to their reliance (in my opinion) on ‘black boxes’ that hide the processes of the game from the player. ‘Openness’ is difficult to facilitate in a computer game and ‘ambiguity’, exemplified in the process of interpreting Brathwaite’s ‘Derail’ card, is outright impossible. Board games are almost always ‘open’ in their design and ‘ambiguity’, while not always desired, can also be accommodated if the design will benefit from its inclusion. Here again, the flexibility of board games is something computer games have yet to equal. Excellent article, Jeremy. The quotations from Brian are very well chosen. At the National Defense University “Connections” wargaming conference that I attended last year, Naval War College professor Stephen Downes-Martin made the similar point about the difficulty of gaming COIN (Matt–you were there for that, no?). Downes-Martin went even further, I think, in arguing that we still do not have enough data on insurgency and counterinsurgency to build a valid model. Nevertheless, we try. Now, the standards for research games tend to be higher than for hobby games such as Andean Abyss. But these observations from Brian Train and Downes-Martin seem to be part of the answer of the puzzle (to me) of why so few board wargames have taken on insurgency topics, when insurgency is so much more common than conventional conflict. My talk at that conference drew on Andean Abyss, as well as Labyrinth and Brian’s “Algeria”, to make a similar point as your’s, Jeremy, regarding boardgames for training. I compared how these three games treated the effects of terror–different in each–to show how playing the games could invite students to discuss various ideas about why insurgents turn to terror as a tactic. Much harder to do with a black-box computer sim than a much more simple and visible boardgame mechanic. Great post, and thanks for the shout out. Being very new to war games, Andean Abyss is one of the games I studied as I was creating the first draft of my rules. The issue of validation is one I have been thinking about a lot as I design the simulation. How do I simulate the conflict without making a judgment about how effective COIN tactics are? How do I accurately represent which events affected which positive or negative developments in security? COIN remains a very divisive topic, and I know I will inevitably disappoint one side of the debate or the other in my final ruleset. The simulation will, by necessity, be an interpretation of Fardh al-Qanoon as you say, so my goal is to create an engine that is a feasible approximation of the dynamics of the operation and environment, with specific rules and values (i.e. “how many free clinics or land distribution schemes add up to a +1 die roll modifier on a mission” as you put it so perfectly) determining the particular worldview and interpretation of results. Like you said, boardgames are easily modified, and so someone who believes the Coalition’s COIN tactics worked very well might propose a certain set of values in the rules, while someone who believes the Sunni Awakening to have been the vital factor might modify how the Sunni faction affects gameplay. These two different versions of the rules might in fact lead to the same result, one which matches the historical one, and it would be interesting to see why. My simulation team will be playtesting Fardh al-Qanoon in about a month, so I will hopefully have some concrete data to mull over as I consider the issue of validating the rules. Jeremy, thank you so much for your kind comments about my comments. I always find it a challenge to articulate my thoughts about COIN and game design, and I’m glad you thought I made sense. I helped playtest Andean Abyss last summer, and I quite like Volko’s approach – but let a hundred countersheets bloom, let a hundred sequences of play contend! Thanks, Brian- I really enjoyed your podcast comments as they helped cement what I wanted to say in the above post. I really appreciate the culture among board game designers that embraces borrowing and tinkering with mechanics in order further a design. Given that much of the debate on many digital issues centers on closed conceptions of intellectual property, its refreshing to see a creative space among analog designers that respects and atributes, but also gives freely so that the culture can change and grow with the times. Also really enjoyed your ‘Guerrilla Checkers’- I’m putting the link to your website below, so others can check it out (as well as your other work) for themselves. I also like the open approach, and ask that credit be given where it’s due. Surely that’s not much to ask; we all owe intellectual debts to many others. In addition to the website, I’ve also started a blog devoted to game designing and thoughts thereon at http://brtrain.wordpress.com/ . COIN, like all doctrines, exists only to justify itself. The people behind Terrorist and Revolutionary organizations and Drug Cartels are opportunists. They win as long as the situation continues at any level – no matter who or how many suffer. COIN merely justifies continuing the status quo at a level acceptable to the established power structure – a political smokescreen for fighting a neverending war we have no will to actually win. All a game does is force players to do the same things their historical counterparts did – albeit in a slightly different order or with a slightly different emphasis – and yeilding more or less the same historical results. It doesn’t give any insights into anything at all. I disagree. Sure, if you want the same ending every time, then keep reading the same book. Gaming is about exploring alternative methods to solve problems. There are plenty of examples of games where players were straitjacketed in what they could and could not do, but these games are not very useful for this. That doesn’t discredit gaming itself. On the other hand, deliberately constructing an “unfree kriegspiel” game this way can and should force players to confront why doing what their historical counterparts did didn’t/ doesn’t work. John- thanks for the comment. I think when you play a historically themed game, you accept on some level that the actions available to you represent what occurred in the actual event (at least in the eyes of the designer and/or the sources they consulted). That being said, games tend to not be interesting if the same narrative path presents itself every time. With Andean Abyss, for example, it’s entirely possible for the Marxist guerrillas to overrun the land and set up a viable counter-state via the building of bases, or the Cartels may be able to develop their infrastructure and ‘bribe’ away any danger due to their accumulation of cash. Different stories present themselves in every session. Now Andean Abyss is not a simulation, nor does it purport to be, and thus certain elements must be abstracted to be represented. Even if one felt that the game and its design or mechanics proved to unsatisfactory in this abstraction, the ability to change the rules allows players to pursue any assumption or hypothesis they believe will make the game either more accurate in its representation or augment its play-value. Because of this, I believe that players can evaluate the model presented and make their own claims or assertions as to its validity or applicability to cover the topic presented. This, to me, is a valuable prerequisite for pursuing insight. Self-promotion is always present in human affairs in some measure. It is also true that those driving a counterinsurgency campaign may well be fighting to win. Certainly the Colombians under Uribe were, and arguably they succeeded. Similarly, revolutionary movements may contain opportunists, but the importance of a grand vision and fighting for something larger than self should not be under-estimated. If Reyes, Mono Jojoy, and Cano were mere opportunists, they were very poor ones, given where they ended up — on the run in the wilderness, hunted down, and killed. Even an entirely channelized “game” would still yield insights about relationships, parameters, capabilities, and so on — at least as envisioned by the designer. John, each time that I read your post, it has the same result; I nevertheless can gain insight from it.